William Branham claimed to have prophecied in 1956 that Billy Graham would cancel his meetings and that this would mark the end of the revival in the United States. What did William Branham actually say? Did Billy Graham cancel any meetings in 1956? William Branham also taught that, just as three messengers went to Abraham in the days of Sodom, so three messengers came to the church in our day. These three messengers were William Branham, Billy Graham and Oral Roberts. William Branham taught that Oral Roberts and Billy Graham were the two messengers that went to Sodom. But William Branham was God himself, the angel that did not go down to Sodom. Over 250 times, William Branham quoted a passage in the Bible - "As it was in the days of Sodom..." - but does the Bible say that anywhere? Billy Granham also figures significantly in our article on The Importance of a Seven-Lettered Name. 1 A prophecy about Billy Graham? A prophecy about Billy Graham? Nineteen fifty-six I prophesied in Chicago that Billy Graham that year would return and cancel his meetings. Tommy Osborn would return, and America would see its last call. And from then the revival would die. I just count back and see. We got that on record. See? And the revival is gone. I’m not saying, as our Brother Billy Graham said, “Answering my critics.” I so thankful I have so few critics. And now, I’ve left my hometown when Billy Graham was over there. And I’ve always wanted to meet Billy Graham. And he’s in Louisville now, preaching. My family and them’s attending. Our churches are closed and everything, a cooperating in the meeting to do everything we can to put the effort. I live about where eighty-five percent of the alcoholic beverages is, that swindles these drunken people on the streets, comes from Louisville, Kentucky. And the tobacco factories, it’s the seat of Satan. And you people in Chicago pray that God will anoint that evangelist Billy Graham till there’ll be a revival break out in Louisville and will just start something. And now, pray for him. And I pray for him all the time, each day and every night and everything. ’Cause God’s using the man in a great way. A very fine brother, so I am told. As a result, we can conclude William Branham never prophecied anything about Billy Graham in Chicago! He simply said, "I believe that America is going to get her last call, this year." Does that make it a prophecy that Billy Graham was going to cancel his meetings? Was it the end of Billy Graham's ministry?? Did Billy Graham cancel his meetings in 1956? Let's examine what actually happened in Billy Graham's ministry. In 1956, Billy Graham conducted at tour of India, Taiwan, Hawaii, Hong Kong, Japan, Korea and the Philippines which started on January 17 in India and ended in Honolulu on March 11. The Bombay rally on January 20, 1956 was canceled because of riots, however, none of the remaining Indian or Asian meetings were cancelled. He held numerous meetings throughout the US in 1956 including an almost month long crusade in Louisville, Kentucky from Sept 30 to Oct. 28, 1956. Dr. Graham went on to hold rallies in St. Louis, MO in the last week of November and in Buffalo, NY on Dec. 13-14. William Branham was aware of Billy Granham's meetings in Louisville. Why did he choose talk about them in 1956 but ignored them in recallng his "prophecy"? And, then, I think that the hour has arrived that this part of the country ought to receive a great visitation, on the coming of our noble brother, Billy Graham, to Louisville, this coming week. He begins the same time, Louisville, I begin in Chicago. So, I’ll be back, through, I—I want to meet him, personally, while he’s here. And some friends is going to introduce me to him. And I’ve been right in the same city, overseas, and many different places, but just, so, we didn’t get to meet each other. Lord God... let men come to themselves and realize that just belonging to the church isn’t what You require. You want men to be filled with the Spirit, born, hewed out, burnt in with the Holy Spirit, branded, men who has crossed the line, God-called men. And we believe that You’re going to send the revival that Billy Graham and many others are praying for. When You can get men out to themselves, away from their school of theology, away from their self-styled ways, fearless men, men of—of character with You, who believes You and takes You at Your Word. There is no record of any US meetings being cancelled in 1956. The only record of a meeting being cancelled in 1956 was the meeting in Bombay which was cancelled because of riots and that was before William Branham's comment in April 1956. 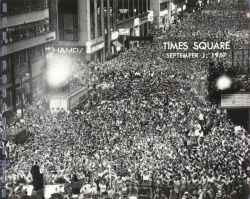 In 1957, Billy Graham held the longest evangelistic crusade in his life - a 16-week revival in New York City, where 2.3 million gathered at Madison Square Garden, Yankee Stadium, and Times Square. On September 22, 1991, Graham held his largest event in North America on the Great Lawn of New York's Central Park. City officials estimated more than 250,000 in attendance. In the 10 years from 1947 through 1956, Billy Graham held 64 crusades. In the 10 years from 1957 to 1966, Graham held 119 crusades. And from 1967 until his last crusade in New York City in 2005, he held another 234 crusades, for a total of 417 crusades held during his lifetime. After 1956, when William Branham said that Billy Graham cancelled his meetings (there is no evidence that this happened in 1956 in which Graham held 3 crusades after his return from an overseas tour). As of 2008, Graham's estimated lifetime audience, including radio and television broadcasts, topped 2.2 billion. William Branham actually prophecied that Billy Granham's meetings would be cancelled in 1956 but the prophecy failed. If this is the case it is another example of William Branham's failed prophecies. William Branham lied about the prophecy and was trying to create the impression that he actually was a prophet. This adds to the problem of his overall credibility. But one has to ask the question: Why was William Branham saying things in 1962 that were blatantly false? Was it because his own ministry faltered badly in 1956 and never recovered, while Billy Granham continued on strong for many decades? Likewise also as it was in the days of Lot; they did eat, they drank, they bought, they sold, they planted, they builded; But the same day that Lot went out of Sodom it rained fire and brimstone from heaven, and destroyed them all. Even thus shall it be in the day when the Son of man is revealed. A list of activities is given (buying, selling, planting and building), and there is surprisingly no mention of the sins of Sodom. It is the thought of unpreparedness and attachment to earthly pursuits rather than of sin which is uppermost. There is a practical warning in face of the coming catastrophe. The picture employed is that of people fleeing without stopping to collect their possessions; the contrast is provided by Lot’s wife who lingered and was lost. Attachment to earthly things will lead to disaster. But now Oral Roberts and Billy Granham are dead! Did the angels to Sodom die before it was destroyed? How does that work with William Branham's faulty typing of the scriptures? Abraham, which was a type, he…We, only being dead in Christ, take on Abraham’s seed, and are heirs with him according to the promise. Any of you in the court, this afternoon, knows that. Watch Abraham. He received all kinds of signs, everything, from the supernatural God in the form of a Light, going between sacrifice. He received Him in a voice, and so forth. But the last sign that Abraham received upon the hill from Sodom, just before the Gentile world was destroyed, was God Himself in the form of a human Being. You understand, court? [Congregation says, “Amen.”—Ed.] There was three Messengers come up to him. Three Messengers, and he went out to meet them. And there was three messengers went forth, come down from Heaven. And there was a denominational group down in Sodom, and a Billy Graham and a Oral Roberts went down there. And remember as I’ve told you, nowhere in the history of the church has there ever been a messenger sent universal to the church, until now, with his name ending like Abraham, h-a-m. G-r-a-h-a-m, six letters, to the world, man’s number. But Abraham had seven letters in the name, God’s complete and perfect number. See? And notice what the messengers did that went out in there: preached the Word, called them out, told them to repent. But the One Who stayed back with Abraham, see, performed a miracle by telling Abraham what Sarah was doing and thinking in the tent behind Him. And Jesus, Who was the One that was in this Person, said, “When the world gets in a Sodom condition, like it was then, the Son of man will be revealed again.” And all the other Scriptures confirming that to be so. ↑ The Holy Bible: King James Version, Electronic Edition of the 1900 Authorized Version. (Bellingham, WA: Logos Research Systems, Inc., 2009), Ge 18:1–2. ↑ The Holy Bible: King James Version, Electronic Edition of the 1900 Authorized Version. (Bellingham, WA: Logos Research Systems, Inc., 2009), Ge 19:1–2. ↑ I. Howard Marshall, The Gospel of Luke: A Commentary on the Greek Text, New International Greek Testament Commentary (Exeter: Paternoster Press, 1978), 664. This page was last edited on 24 February 2018, at 22:54.